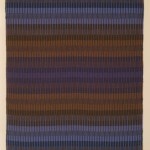 hand-dyed wool, linen warp, ikat technique 55h x 30w 2010 Inspired by the remote wilderness area in northern Minnesota. This series is an abstraction of the quintessential experiences of the wilderness. hand-dyed wool, linen warp tapestry 63h x 38w 2010 The visitor to the Boundary Waters Canoe Area travels by canoe and brings only what can be carried in a backpack. This simplified palette and design remind me to travel light and live unencumbered. 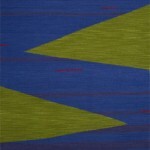 Cotton, Weft Ikat technique 40hx28w 2011 $950 This exploration contrasts the opposing experiences of wilderness and urban; intense blue water and linear gray in the city. 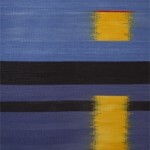 Cotton, Weft Ikat technique 20h x 19w 2011 $500 The soothing call of night time in the wilderness contrasts with the geometry of city living. 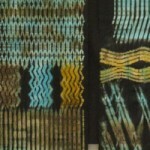 Cotton, Weft Ikat technique 20h x 18w 2011 $400 The colors are of the soil, the trees, and campsite that feel like home in contrast with the geometry of my calendar and chaos when in the city. 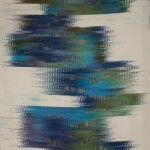 Cotton, woven shibori technique 57h x 46w 2011 $2100 The flash of lightening through the windows reflected a blue-green sky and silhouette of the trees. 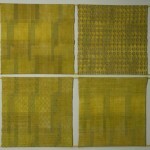 Also inspired by kente strip cloth. 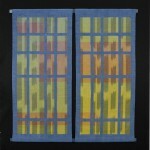 Double ikat, double weave technique Cotton 47h x 46w 2010 SOLD The window frames, real and devised, affect the way we see the world. 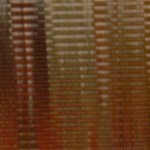 Windows captures the light interplay through the trees. 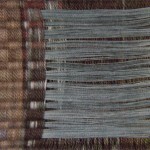 Double ikat, weft float technique Cotton 36h x 36w 2010 Crop Circles was inspired by the patterns as seen from an airplane window. 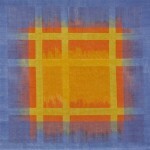 Double ikat, double weave technique Cotton 24h x 74w 2010 $2700 Using both double ikat and double weave technique, Sunset Series integrates the window grid into the setting sun. 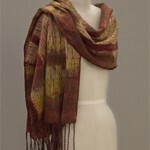 Cotton, Woven Shibori technique 20h x 90w 2011 Woven shibori process is used to create beautifully patterned wraps and scarves. Wool, Linen Krokbragd technique 60h x 38w The rich wool colors give classic rug designs a contemporary look. 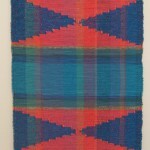 Cotton warp, cotton fabric 60h x 28 Rag rugs allowed me to play with color and composition for my functional artwork.